View of the Keep at Kenilworth Castle in Warwickshire. Kenilworth is the largest castle ruin in England and was one of the country’s most magnificent royal residences. The original Norman fortress was founded in the early 12th century by Geoffrey de Clinton, chamberlain of Henry I. The stone keep in this view was built later in the century, and replaced a structure which was probably of earth and timber. 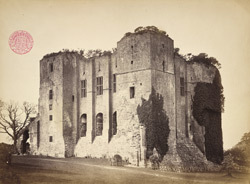 Its massively thick walls and square turrets set high on a steeply-sloping plinth were designed to give the building maximum defensive strength and height. The top floor was a fighting gallery, and is still equipped with its arrowslits. By contrast the large Tudor windows on the middle floor are much later additions. The keep was the last bastion against attack should all the castle’s other defences fail. These included an earthwork, a palisade, a moat and a vast lake known as the Great Mere which surrounded the castle on three sides.